When you hold the two-piece design in your hands, you will be able to feel what a well-devised mix of shape, style, colorfulness and outstanding product quality is behind the Buggy Keeper. 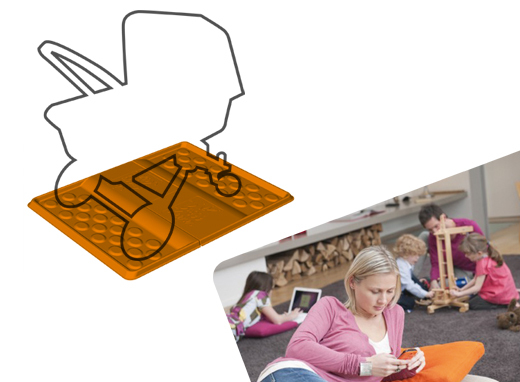 We are naturally very proud that everything about the Buggy Keeper – from the idea to the production – is in the hands of German designers. The special design allows the buggy to be rolled on easily whilst a special lip prevents dirt and water from spilling over. Simple assembly of the two sections makes storage, transportation and pick-up easier. All conventional buggies can easily be positioned on the Buggy Keeper. Wheel Dimensions 140 x 80 cm. Robust PVC. Low emission production using an extruder process. A two-piece connecting system allows for very easy cleaning of dirt and water and as well as transportation. Cleanliness and hygiene are guaranteed due to a water-resistant coating. The intelligent dot design means quick drying and highly effective dirt removal are possible. 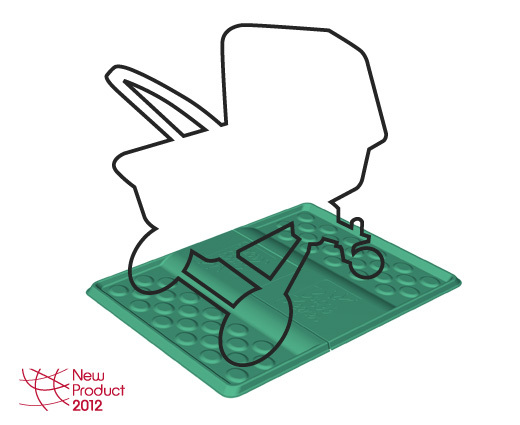 The anti-slip pads on the base of the Buggy Keeper allow for a stable and sure footing.